Even small fireworks can upset your dog. For many pooches, fireworks are anything but festive and fun. The loud, erratic banging can send your dog into such a state of panic that he tries to run and hide. Not surprisingly, more dogs go missing on the 4th of July than any other day of the year. Bring your dog inside, even if he normally prefers the outdoors. Make a little nest of blankets and pillows inside the closet, or wherever your dog tends to hide during fireworks. You can also create a makeshift closet by lining his crate with several soft blankets or towels. A cozy, comfortable space will help calm your dog and make him feel less frightened when the booming noise begins. Close the windows and blinds. This will help drown out the noise and block the anxiety-producing flashes of light outside the windows. Remember, a dog's hearing can be 10 times as sensitive as humans, which makes loud fireworks physically painful for your pup. Increase the volume of white, background noise that is familiar to your dog. For example, turn on the air conditioning unit or turn up the television. 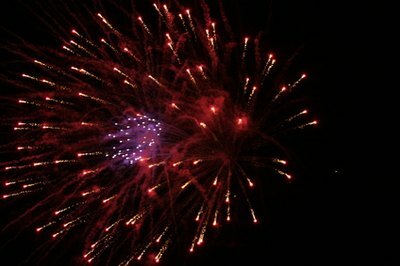 These sounds won't completely eliminate the sounds of the fireworks display, but they'll muffle the volume and intensity. Dress your dog in a pressure shirt, sometimes called "thunder shirts." As the original name suggests, these wrap-around vests were originally designed to calm dogs during thunder storms. The vests have a relaxing, comforting affect on your dog by applying constant, gentle pressure to the core of his body. Walk your dog at sunset before the festivities begin. Dogs who are terrified of fireworks will typically refuse to leave the house during or soon after the displays. Don't expect your dog to hold his bladder until the next morning or he'll leave his own little gift for you on the floor. Leave your dog's food and water near his crate or safe spot so he won't have to choose between safety and thirst. Attach current, easily readable identification tags to your dog's collar. If for some reason he breaks through a window screen and tries to run away during the fireworks, having a proper ID will prevent him from ending up at the shelter. Can I Use Shredded Paper in a Dog Crate? Do Dogs Prefer to Have Another Dog for Companionship?